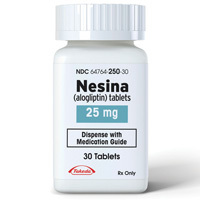 Alogliptin is the generic drug name for a brand name type 2 diabetes medication called Nesina. It is used to help individuals with type 2 diabetes control their blood sugar levels when this control cannot be achieved through diet and exercise alone. That being said, this drug is meant to be used in conjunction with an appropriate diet and exercise and may also be used with other antidiabetic medication. It is important to control high blood sugar to help prevent serious health issues, such as kidney damage, nerve problems, blindness, sexual function problems and loss of limbs. Alogliptin is a dipeptidyl peptidase-4 (DPP-4) inhibitor. The way it work is it increases the levels of incretins in the body. By increasing the level of these natural substances, it increases the amount of insulin released by the body, especially after a meal. Additionally, incretins also lower the amount of sugar made by the liver. Just like any medication, alogliptin is not without side effects. Although many people who take this medication, take it without serious complications, inform your doctor immediately if you should experience: joint pain, unusual skin blisters, signs of heart failure (e.g. swelling of the feet and ankles, unusual tiredness, shortness of breath, etc.) or any other symptom that may be unusual or causing you concern. It is also important to note that if this medication is prescribed alongside another antidiabetic drug, hyperglycemia (high blood sugar) may occur. Signs include confusion, drowsiness, thirst, increased urination, rapid breathing, fruity breath odor, etc. If you suspect you have hyperglycemia inform your doctor immediately. Alogliptin is not safe for everyone to take. Individuals who are allergic to any ingredient in the product, those with type 1 diabetes and those who have high blood ketone levels (diabetic ketoacidosis) should not use it. Be sure to tell your doctor about any medical conditions (past or present) and any medication (prescription, non-prescription or dietary supplements) you may presently be taking. Also, inform your healthcare practitioner if you are pregnant, nursing or planning on becoming pregnant. Finally, remember that if you have been prescribed alogliptin, your doctor believes that the benefits of taking this medication outweigh the risks. Take this medication exactly as it has been prescribed to you. If, for any reason, you feel that this medication isn’t right for you, talk to your doctor first before you take it upon yourself to alter the dose or you stop taking the medication altogether.